This land is our land! The movement for access. Monday 24th April 2017 will be the 85th anniversary of the infamous Kinder Trespass, an event that passed into history as an iconic, direct challenge to the age-old authority of the landowning classes. 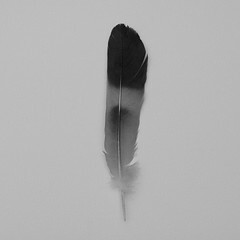 There is more to the story than just the trespass alone. It is just one incident in a long fight for access to our beautiful countryside, that has resulted in our right to roam today. The Chumbawamba song ‘You Can (Mass Trespass, 1932)’ on their 2005 album ‘A Singsong and A Scrap’ captures the bravery and positive attitude of a working class movement that began at the end of the nineteenth century. The movement for access to our Pennine hills and moors by ordinary people, cooped up all week in grimy, polluted, industrialised towns and cities, in pursuit of clean air, exercise and the simple appreciation of our beautiful Pennine landscapes. A movement that eventually led to the celebrated 1932 mass trespass on Kinder Scout, the formation of our nation parks, the creation of the Pennine Way and eventually the right to roam. Our Pennine hills have for centuries fostered the expression of free thought, radicalism and the demands for the rights of common people. Maybe it is something in the water that falls from the boundless skies, to percolate through the peat and gritstone into our reservoirs. One of the first named individuals in British history – Venutius, the estranged husband of the first century Brigantine Queen Cartimandua, made his stand against the Romans among the Pennine hills. Through the ages there are tales of King Arthur, resistance to Norman rule and Robin Hood’s exploits. The Luddites practised their drills on the moors near Huddersfield and the Chartists held their meetings on the hill tops, away from the factory owners and the prying eyes of authority. The Manchester lawyer (a contemporary of Friedrich Engels and Karl Mark) Ernest Jones’ 1846 speech to 30,000 people, among the gritstone outcrops of Blackstone Edge is still remembered. A Chartist rally on moorland. A sounding song of liberty! At the time of the trespass, well known Peak District landscapes such as Kinder Scout (which had been enclosed in 1830), Stanage Edge and Bleaklow where the privately owned preserve of the privileged few. These grouse shooting moors were fiercely guarded by estate gamekeepers, only used for a short time each year to provide sport to the landowner and his parties of privileged friends. At Stanage Edge on most days, you will now find climbers all along the escarpments, but in the early years of the twentieth century, climbers used to bribe gamekeepers with barrels of beer to turn a blind eye, in order to pursue their sport. It hadn’t always been this way. Even when William I parcelled up Britain into ‘Honours’ for his supporters in the Norman gentry and great swaths of our lands were declared to be Royal Hunting Parks, some common land was put aside in most manors, for use as a resource by ‘commoners’. Manorial tenants had rights to pasture their sheep, take wood and turf, fish or take sand and gravel and what was considered waste ground, was farmed by the landless. This arrangement stood for centuries, throughout the medieval period, the English Civil War and into the beginnings of the Industrial Revolution. Enclosure Acts had existed since the twelfth century, but from about the middle of the eighteenth century, the pace of enclosures of ‘common’ and ‘waste’ land increased sharply. Land would be divided into parcels (many of Yorkshire’s famous dry stone walls date from this period) and either sold or leased out. The obvious effect of this was to increase profits for the estate owners, it also saw people who had previously worked the land evicted, dispossessed and forced to move to the towns and cities to work in industry for subsistence wages. The punishment for throwing down fences that enclosed common land was death. As trade between the growing towns and cities increased, the informal network of tracks and hollow ways became literally bogged down and unsuitable for growing coach traffic. Turnpike Trusts were formed to build improved roads and charge a fee at toll houses to pass along them. As many of the ancient routes used for centuries had been blocked by enclosures, more traffic was forced onto the turnpikes. It is no coincidence that the landowners also tended to be trustees of the turnpike roads. The first half of the eighteenth century was a turbulent time. The Napoleonic Wars, trade barriers, increasing mechanisation and the hated Corn Laws brought a desperate population to the brink. Probably the closest that Britain has ever come to revolution. Fearing the influence of the French Revolution would spread, the Combination Acts of 1799/1800 outlawed the formation of trade unions. This act was repealed in 1824 and a push for universal representation began, in the form of the popular movement of Chartism. By the end of the century trade unionism had entered a period of unparalleled growth and by 1918, membership stood at six and a half million, inspired by the revival of socialism. Workers not only demanded better pay and conditions, but a better work-life balance too in the reduction of working hours to eight hours per day. It is worth remembering that at this point, the working week was still six days and workers (particularly the young) who had been cooped up in factories all week began to look for better uses of their leisure time. This led to the formation of a number of sports and recreation clubs within the growing Labour movement. Much of the moorland of the Peak District was at this time privately owned and used for only a few days of grouse shooting per year. 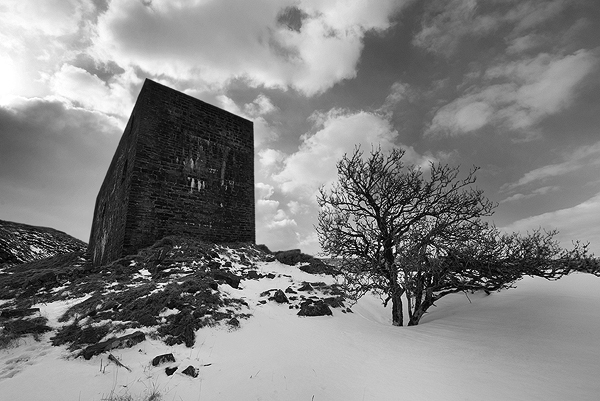 The latter part of the 19th century saw the moors more keenly managed for this purpose and access became even harder. The ancient footpath up William Clough on the western side of Kinder was closed by the landowner in 1877, only to be re-opened in 1897 after campaigning by the Peak District and Northern Counties Footpaths Preservation Society. In 1900 George Herbert Bridges Ward (who became known as the ‘King of the Ramblers’, Ward’s Piece on Lose Hill is named after him), the first Secretary of the Sheffield Labour Representation Committee, formed the Sheffield Clarion Ramblers (named after the socialist newspaper ‘The Clarion’). This was the first true working class rambling club, as opposed to the existing rambling associations that tended to be composed of the middle classes, with Dukes and Earls among their patrons. Other working class rambling clubs soon followed. Ward was convinced that the landowners were acting illegally in stopping ancient paths and bridleways across the moors and spent many long hours researching rights of way. As early as 1907 the Clarion Ramblers organised a mass trespasses on Bleaklow, again in 1911 and continued to do so until 1927, when the owner Lord Howard re-opened the Doctor’s Gate path. Regular trespasses also took place at Winnats Pass from 1926 until 1939. The most enthusiastic enforcer of injunctions against trespassers was Manchester businessman James Watt, who owned the area around Kinder Downfall. He issued an injunction against Ward in 1923 forbidding him to trespass on Kinder Scout and from encouraging others to do the same. However, despite this Ward is pictured below, trespassing on Kinder Scout soon after in January 1924. 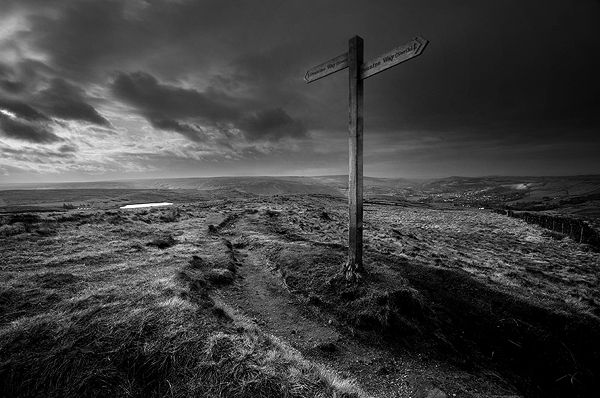 Only twelve legal footpaths were available to walkers, allowing access to about one percent of the Peak District, access to the vast majority of moorland was forbidden. These few footpaths became overcrowded as the number of ramblers grew. 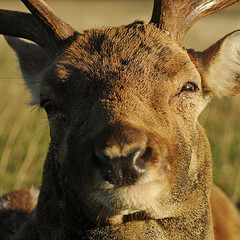 Walkers would often sneak off the paths to find quieter places, to be chased off by gamekeepers. In 1928 Ward noted that the summit of Kinder Scout was, “overrun with ramblers of all types.” It is thought that by 1932, 15,000 people left Manchester alone, every weekend to walk in the Peak District. 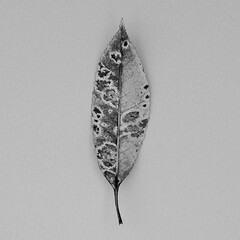 Resentment towards the landowners was growing. The 1932 Kinder Trespass has become an iconic event in British history, a demonstration that people power can really work. Benny Rothman, one of the trespass organisers who were imprisoned for their part, became the figurehead of the trespass. He campaigned about access and environmental issues for the remainder of his life. Flyers distributed around Manchester called for attendance at a rally in Hayfield Recreation Ground on 24th April. This was changed to Bowden Bridge Quarry at the last minute to avoid the police and the Parish Council, who had posted copies of local bylaws forbidding meetings there and supplied the Parish Council Clerk to read them if anyone attempted to make speeches. About 400 ramblers met at the quarry and after short speech by Benny Rothman, who stepped in when the scheduled speaker decided to pull out, set off along the legal footpath towards William Clough at 2.00pm. 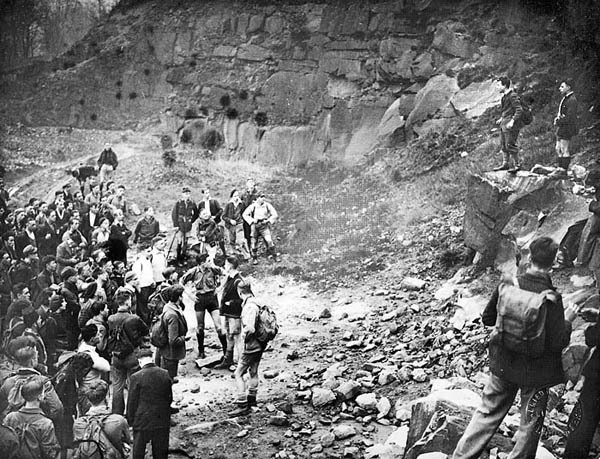 The rally at Bowden Bridge Quarry. Trespass song based on a parody of ‘The Road to the Isles’. At Nab Brow, they caught first sight of the keepers dotted along the slope beneath Sandy Heys. A whistle was sounded for the troupe to stop. On a second whistle they turned right to face Kinder Scout. When the third whistle sounded, they began to scramble up the steep slope towards the keepers. Although a few minor scuffles ensued and in some cases, the gamekeeper’s sticks were taken and turned against them, there was only one injury (a gamekeeper knocked unconscious suffered a twisted ankle). In the majority of cases, the protesters just walked through the line of keepers, they reformed at the top of the brow and were greeted by a smaller group from Sheffield who had made their way up from Edale (one account by a gamekeeper states that there was no group from Sheffield and another account says that the Sheffield group joined the rally at Ashop Head). 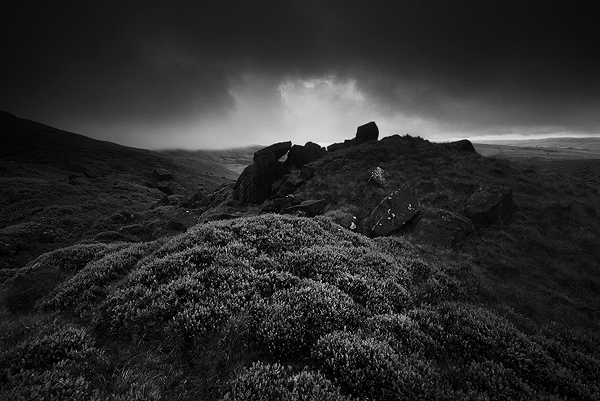 Low cloud skims the hill tops of William Clough, Kinder Scout. Being unfamiliar with the terrain, the Manchester group didn’t actually make it to the summit of Kinder Scout. They instead turned towards Ashop Head where a short rally was held, before retracing their steps along the path down William Clough. They were met by the police at the Stockport Corporation Water Works and an attempt to grab someone from the crowd was chased off by the ramblers. At the beginnings of Hayfield village, they were met by an inspector in a police car, who suggested that they form a column behind him to lead them into the village. They did this and sang as they marched into Hayfield. It was of course a trap, as when they reached the centre of the village they were stopped by police who began to search among them, accompanied by gamekeepers. Six arrests were made (five on the return to Hayfield and another later that afternoon). Benny Rothman was one of those arrested. They were first of all detained at Hayfield, then taken to New Mills, due to the crowd gathered outside calling for their release and charged with unlawful assembly and breach of the peace (notably not trespass, which was a civil offence), as the Duke of Devonshire insisted on pressing ahead with charges. All pleaded not guilty, so Benny Rothman, Tony Gillett, Harry Mendel, Jud Clyde, John Anderson and Dave Nesbitt were committed for trial at Derby Assizes. It was said that the jury was composed of a cross section of the Derbyshire country establishment, including two brigadier generals, three colonels, two majors and two aldermen. Despite an impassioned speech by Benny Rothman, it was obvious that they were not going to get a sympathetic hearing and they were handed jail terms of between two to six months each. 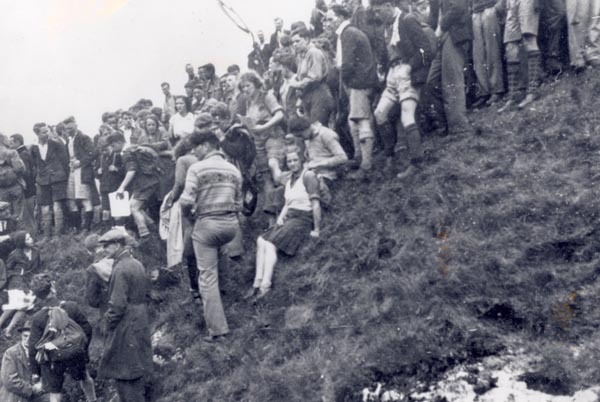 The mass trespass at WInnats Pass, 1932. The sentences, seen as draconian even then, caused outrage and probably did more to promote the cause than the trespass itself. A few weeks after the trespass, 10,000 ramblers assembled at the annual rally at Winnat’s Pass. On 18th September 1932 another trespass of about 200 Sheffield ramblers took place at Abbey Brook in the Upper Derwent Valley, via the Duke of Norfolk’s Road. The authorities had learned their lesson at Kinder Scout and did not wish for the trespass to become public knowledge, so there were no arrests this time, but upon arriving at Abbey Brook the trespassers found about forty gamekeepers and a few police waiting for them. Brief scuffles ensued before the trespassers sat down and ate their sandwiches. 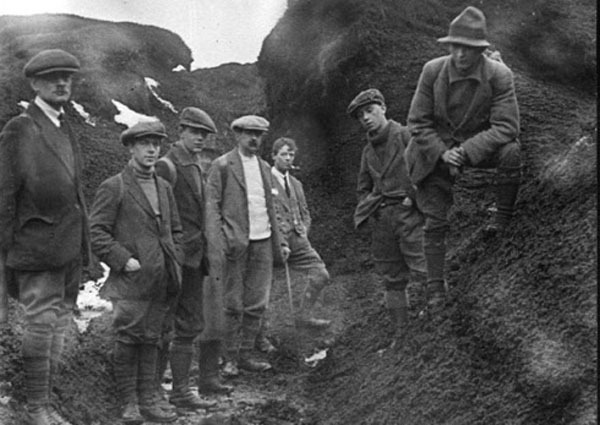 The momentum for public access to the hills and moors was growing. Throughout the 1930s, moves were made towards the creation of national parks, an idea first raised by Ramsay MacDonald in 1929 and the subject of the Addison Report in 1931, although it would be another twenty years before the establishment of the Peak District National Park. The Addison Report was kicked into the long grass during the depression of the early 1930s but resurrected at a conference in 1935. The Standing Committee for National Parks was formed in 1936 and published ‘The Case for National Parks in Great Britain’ in 1938. In 1939, the Access to Mountains Act finally passed through parliament as a Private Member’s Bill, introduced by Arthur Creech Jones (Labour MP for Shipley) but in such a mutilated form that it was described as a landowner’s charter and for the first time, made trespass a criminal offence in certain circumstances. It was bitterly opposed by the newly formed Rambler’s Association, who sought to repeal the long fought for bill. Throughout the 1940s, the momentum towards the establishment of national parks continued, including the publication of the 1947 Hobhouse Report, suggesting 12 potential national parks. This resulted in Clement Atlee’s visionary post-war Labour Government passing the National Parks and Access to the Countryside Act 1949. The Countryside Commission and the Nature Conservancy Council were formed under the new act (both merged in 2006 to form Natural England). 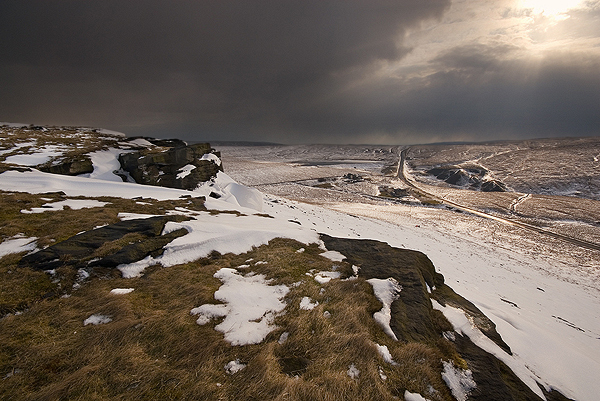 On 17th April 1951, the Peak District National Park became the first of its kind in Britain. 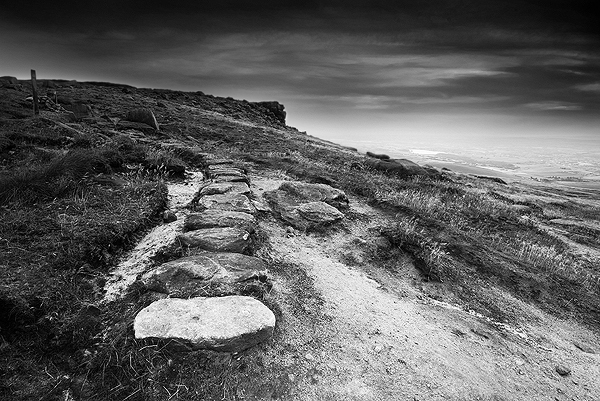 In 1955 the first access agreement for Kinder Scout was signed and in 1962, access to Stanage Edge was agreed. Alongside these gradual steps towards the creation of the national parks, a special mention must be given to the remarkable Tom Stephenson who in 1935 set into motion the idea of the ‘Jubilee Trail’. Thirty long years of persistent negotiation followed, his dream eventually realised when in 1965 the Pennine Way opened, stretching roughly 268 miles from Edale to Scotland. 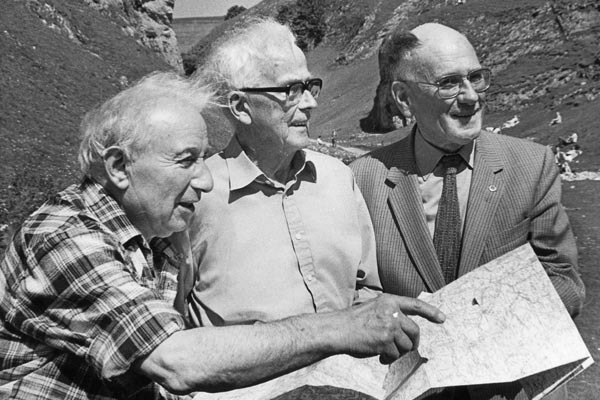 Imprisoned for his beliefs as a conscientious objector during the First World War, Tom Stephenson fought for access throughout his life and as Secretary of the Ramblers’ Association from 1948 to 1968, was instrumental in the creation of the national parks too. The 1968 Countryside Act placed a duty on every minister, government department and public body to have, “due regard for conserving the natural beauty and amenity of the countryside.” In 1970, the Peak District National Park purchased the North Lees Estate, including Stanage Edge. 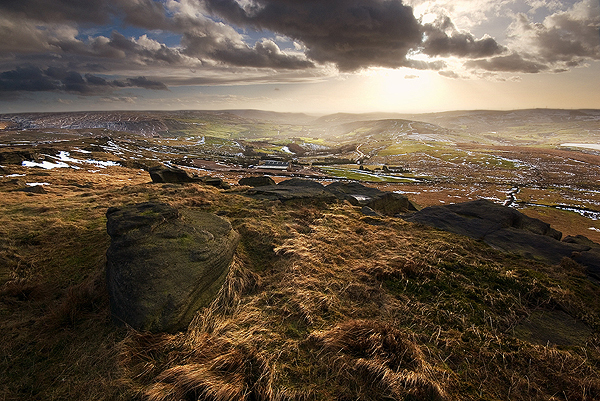 In 1982, the National Trust bought Kinder Scout and declared it open for access in perpetuity. 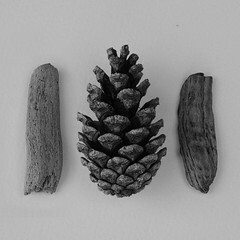 Benny Rothman (left) and Tom Stephenson (centre), Stephen Morton (right). Even now, in what we like to think of as an elightened age, our rights of access are under attack. The Infrastructure Act 2015 clears the way for publicly owned land to be seized and sold to private bidders with all protections such as SSSI status and rights of way extinguished. This is the same act that allows oil and gas companies to drill and frack under our homes without first seeking our permission. It could also see fracking companies invade and industrialise our National Parks, resulting in not only access to some of our best loved landscapes once again forbidden, but the potential to pollute some of our most fragile landscapes. Part of the western fringe of the Peak District National Park falls into the latest round of fracking licencing blocks and there is no guarantee that further licences won’t intrude deeper into the park in future. When in 1990 the Peak Park Authority decided to close Kinder Scout for the whole of August, in order to discourage hunt-sabbing of the grouse shoot, public pressure soon persuaded them to change their minds. Government and fracking companies will find that they have wildly misjudged the public mood should they threaten our National Parks or countryside. Those wild Pennine hilltops are as important as any listed building and budget cuts to the Peak District National Park Authority have already threatened its continued ownership of iconic locations such as Stanage Edge. Should this act result in the sale of our public land to private interests, or a bar placed on access to our cherished landscapes, the hilltops will once again ring with demands for justice. Benny Rothman later expressed regret that he didn’t work more closely with the ramblers’ associations of the time, who distanced themselves from the trespass and considered it to be a politically motivated attempt to grab the headlines. However, as a piece of direct action it was spectacularly successful, as it provided the public impetus that forced the issue into the open and gained a lot of public sympathy for the cause. As each anniversary slips by the trespass creates its own mythology and has come to symbolise the struggle between the working and the landed classes as effectively as the Peasant’s Revolt or the Chartists. It is important that we keep the spirit of Benny Rothman, Tom Stephenson, Bert Ward and all of those men and women who fought for our rights to protect and access our beautiful landscapes alive. Over looking the trespass site at William Clough towards Sandy Heys (in cloud). This article has been adapted and expanded from the original version published in 2012 for the 80th anniversary of the trespass. Beautiful views across our National Parks and your rights to access them will soon be under threat. As I write, the ‘Infrastructure Bill 2014’ current sits in its committee stage before the House of Lords (next due before the Lords on 14 October 2014). You may or may not have heard of it. Its best known component is to introduce the right for companies to ‘frack’ under your home, without first seeking your permission. There is however an even more insidious aspect to this bill that could undo decades of progress in terms of the formation of our national parks, access to our landscape and the protection of our wildlife. The intention of this bill is clear. Its primary purpose is to ease the way for corporations and developers to gain unhindered access to any part of our land that they wish to use for development or to frack for shale gas. As a landscape photographer, lover of nature, supporter of public ownership of our nation’s assets and access rights to our cherished landscapes, this bill causes me deep concern. It is beyond dispute that we need more homes (although an awful lot could be done to assist local authorities bring empty houses back into use) and infrastructure to service those homes. It is however the nature of this bill that shows flagrant disregard for public ownership, public access and local consultation. Local councils will be ordered to give over 90% of their brownfield land to the Housing and Communities Agency (HCA). Brownfield sites are previously developed sites that have become vacant, but could be reused and include parks, playing fields, allotments, woodlands, public facilities and village greens. This bill will take away any local power of decision over land use and pave the way for publically held land to be transferred to the HCA, who can extinguish existing protection and rights of way, such as access under the Countryside Rights of Way Act 2000, possibly even protection for Scheduled Ancient Monuments and Sites of Special Scientific Interest, grant permission for new roads and buildings and sell off land as it sees fit. Any private company that buys the land will no longer be subject to local planning regulations and consultation. The Secretary of State will be able to grant to any development without the involvement of locally elected members or council departments such as planning , simply by consulting a panel of as little as two people. In short, we could well see our national parks, playgrounds, village greens, woodland, allotments or any other publically owned facility, sold off to private companies to build on, frack, quarry, lay railway lines or do whatever they like. 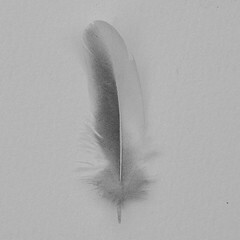 One thing can be taken as a certainty, we will have no say. As for fracking, that is another matter entirely which would need an extended essay in its own right. Let’s just say that it would be a disaster for our national parks, countryside or communities to have this nightmare imposed upon them. It represents no cure at all for our energy security or economy, will not bring about any appreciable long-term boost for jobs, will not lower energy prices and will be an environmental disaster in terms of its effect on wildlife, water supplies and air quality. I urge you to go and find information on fracking for yourself and not take my word on this matter. Rights of access for ordinary people to some of our best loved landscapes could be lost. It would be as if the Kinder Trespass had never happened. The lifetime of hard work by Tom Stephenson, who’s commitment and passion led to the opening of the Pennine Way, undone. Our national parks just a fond memory (massive budget cuts have already seen the Peak District National Park Authority forced to put many of its best loved locations up for lease or sale)and the long fought for ‘Right to Roam’ extinguished. We could well see a return to the days when ordinary people were excluded from their own landscape. The Infrastructure Bill represents the biggest land-grab since the Enclosure Acts of the eighteenth and nineteenth centuries. When George Osborne stated that green spaces would be protected, he meant the estates of his wealthy friends. Lands belonging to the Crown are conveniently exempt. What do Labour have to say about this? Surprisingly little. Surely we can rely on Labour to champion the rights of common people? Unfortunately not, they have no current plans to oppose the bill. It seems that the transformation of the Labour Party from its socialist roots to neoliberal corporatists is complete. So there we have it, all nicely stitched up for a foregone conclusion. Private companies win and the rights of ordinary people are trampled over once again. Once these measures are passed into law, they will be very hard to reverse, even if the will from any future government to do so is there and all current indications point to that being unlikely. What can we do to stop this? In all probability, not an awful lot but we must try. You can write to your MP or councillors and express the strength of your opposition. With next year’s general election on the horizon, your local politicians will be keen to gain your support, especially in marginal constituencies. Let them know how much of an important issue this is. You can get involved in your local community groups, rambler’s groups or outdoor sports groups and spread the word, or get involved in your local anti-fracking group. But most important of all, keep the spirit of Benny Rothman, Tom Stephenson and all of those men and women who fought for our right to protect and access our beautiful landscape alive! This upright stone is thought to be a medieval waymarker, sited on an old packhorse route, overlaying a Roman road crossing the Pennines. A rude latin cross is incised on the stone, with the letters I.T. 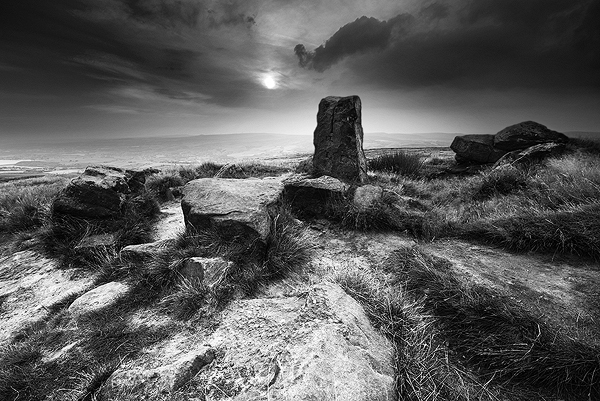 Possibly used as a stopping point to say prayers for a safe journey over the moors (being a much more dangerous undertaking thatn it is today), or sometimes as a resting place for those carrying coffins, where prayers for the dead would be recited (1). It is also possibly a boundary marker, being so close to the Yorkshire/Lancashire boarder. 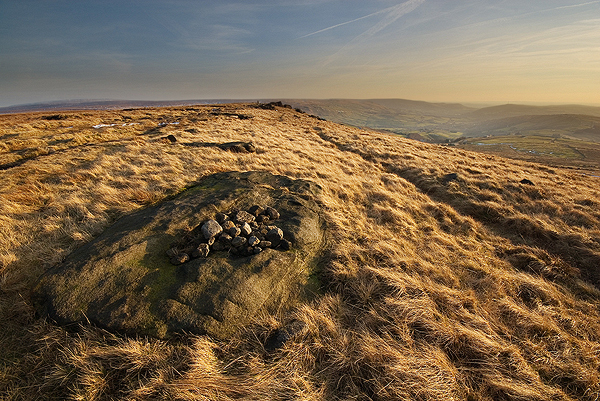 At the highest point on these lonely, windswept moors, sits a weather worn boulder known as Robin Hood’s Bed. The top of the boulder is hollowed out in a large depression. Legend has it that Robin Hood once slept here, while his followers stood guard. There is a possibility that the Robin Hood legend here could have displaced a much older legend, that the site was the resting place of an ancient leader. In old Welsh, the word bedd means ‘grave or tomb’ (4). The etymology of the nearby village of Walsden means ‘Valley of the Welsh’ (5). Anglo-Saxon settlers called the indigenous Britons, ‘Welsh’, meaning foreigner. So it is possible that the name derives from the old British site of an ancient tomb. Another oddity is that when I reached here, after climbing from the car park near the M62, I saw a line of people dressed in what appeared to be white robes walking away on the footpath that leads to the car park near Blackstone Edge Reservoir! It is hard to believe now that this high moorland outcrop played a part in the battle for our civil rights. Yet on Saturday 1st August 1846, 30,000 people from the surrounding mill towns and villages gathered here at a Chartist’s rally, to hear Manchester radical Ernest Jones speak. The days of radical uprisings, the outlawing of trade unions, the hangings and deportations of the Luddites and the Peterloo Massacre in Manchester, were still within living memory. 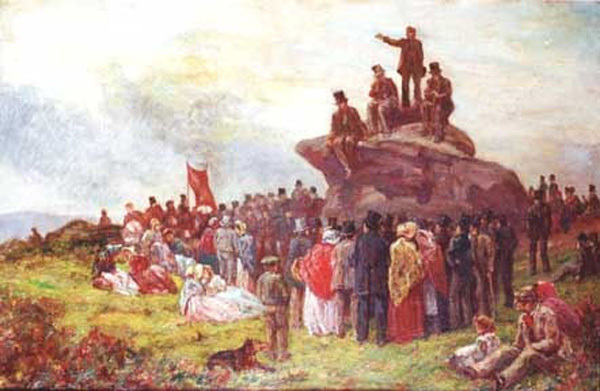 The Chartists were the first mass working class labour movement, calling for political reform in Britain, they would often hold their meetings in remote places to avoid the attentions of the mill owners and police. They took their name from the Peoples Charter, first published in May 1838 calling for, amongst other demands, universal suffrage. Between 1838 and 1851, five petitions were put to parliament. The second in 1842 containing over three million signatures. All were voted down by MPs (leading to the Yorkshire and Lancashire Plug Riots). Although Chartism itself failed to achieve it’s aims, it did seriously unnerve the political elites and opened to door to winning gradual political reform throughout the remainder of the nineteenth and into the twentieth century. Of – death to class monopoly! For many, the name Hartshead will only be familiar via the motorway service station on the M62, just before the junction 25 turn off for Huddersfield. However, this quiet little corner of West Yorkshire guards a deep sense of history. The first known church to be built here was a Norman church, built in at least 1120 when the Earl of Warren granted the site to the Priory of Lewes. Some elements of the Norman stonework still survive. This may have replaced an earlier Saxon chapel. In a field nearby lies the Lady Well, where it is thought that Paulinus may have performed baptisms and hints at a much longer tradition of worship here, going back well before Christianity reached Britain. 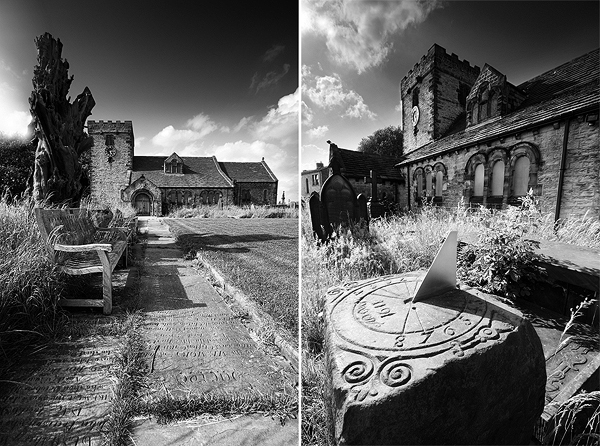 The church was remodelled in 1662 and was extensively renovated in 1881, which is the structure that we see today. In the churchyard stands the remains of an ancient Yew tree, which is probably at least as old as the church itself. Local folklore tells that Robin Hood cut his final arrow from this tree before his arrival at the nearby Kirklees Priory (Nunwood in Charlotte Brontë’s ‘Shirley’). It is said that he was the nephew of the Prioress and sought refuge here to be bled (a common medieval cure for ailments). Upon his arrival with his companion Little John, he was installed in the gate house, where either by accident or design the Prioress bled him to death. His grave is still reputedly in the grounds of Kirklees Park (another version has his final resting place at Hartshead Church). Little John left casting a curse on the Priory and it is said that the Prioress’ ghost still stalks the grounds. 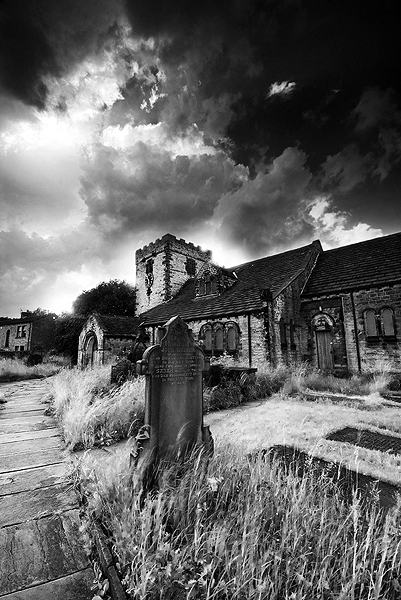 Patrick Brontë served as vicar here from 1810 to 1815, at a time when the Huddersfield area was in the grip of revolutionary Luddite uprisings that so scared the authorities, 1000 troops were garrisoned in the town. While at Hartshead, Brontë met his wife Maria and had two children, Elizabeth and Maria, neither of which survived infancy. Charlotte Brontë later based her book ‘Shirley’ on the area, with Hartshead Church being cast as Nunneley. On the night of 11th April 1812, between 150 to 300 Luddites gathered near the waymarker known locally as ‘Dumb Steeple’ in Cooper Bridge. They set off across Harthead Moor with the intention of storming William Cartwright’s Mill at Rawfold, near Cleckheaton. Cartwright had received a tip-off and had fortified his mill in preparation, arming a handful of employees and appealing to the Cumberland Militia (stationed just a mile away) to provide men. What followed can only be described as carnage. As the Luddites attempted to break in, they were fired at from the mill and were eventually forced to withdraw, leaving behind two seriously wounded men. The wounded were taken to the Star Inn, Roberttown, were both died from loss of blood. Many others were wounded and it is said that trails of blood and flesh, even a finger were found in the area around the mill. 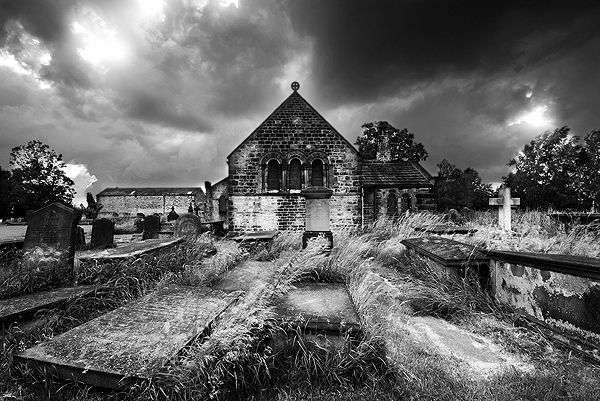 It is known that several Luddites died later from their wounds, some reputedly being buried in secrecy in Hartshead Churchyard. Patrick Brontë was opposed to the Luddites, but did not stop the funerals. The Luddite losses at Rawfold led directly to an act of revenge, with the shooting of William Horsfall, the owner of Ottiwell’s Mill in Marsden, while en-route over Crosland Moor back to Marsden from Huddersfield*. The Milnsbridge Magistrate, Joseph Radcliffe pursued the case vigorously and three men were hung at the New Drop at York Castle for their supposed part in Horsfall’s murder. A further thirteen men hung, for their part in the raid on Rawfold’s. 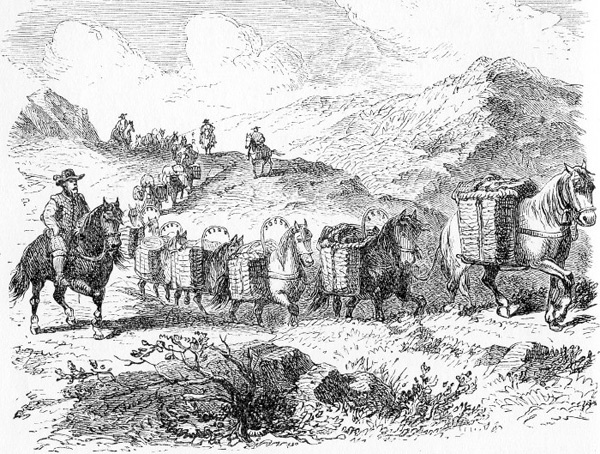 Although the authorities managed on this occasion to stamp out the threat of the Luddites, resentment burned for generations to come and this was just the first of many uprisings and campaigns in the area, that eventually led to the formation of Trade Unions and better working conditions. *To be covered in detail in a separate article to come. 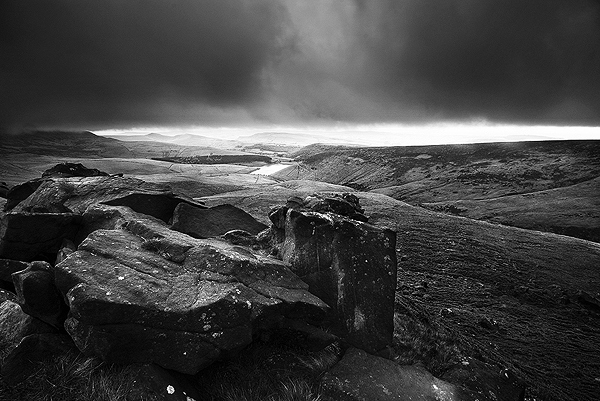 Rock on the slopes of Kinder Scout, overlooking a moody William Clough. Sunday 24th April 1932 is a date that resonates in the history of the Peak District. As this was the day when more than 400 ramblers took to the then private Kinder Scout, to challenge the landowner (the Duke of Devonshire) over access rights. As we approach the 80th anniversary of this watershed moment in the history of countryside access, it is a good point to assess what progress was made after the trespass and how we currently approach the subject. 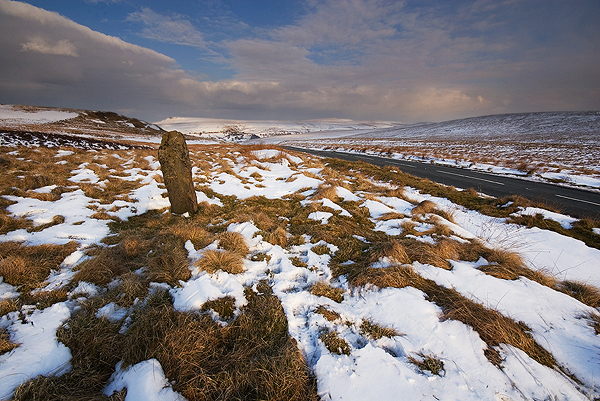 The 1932 Kinder Trespass has become an iconic event in British history. A demonstration that people power can really work and a small part of the over all movement for a fairer and more equal society. Benny Rothman, one of the trespass organisers who were imprisoned for their part, became the movement’s figurehead. He campaigned about access and environmental issues for the remainder of his life. Successive enclosure acts throughout the 18th and 19th centuries had snatched swathes of what was once common land. 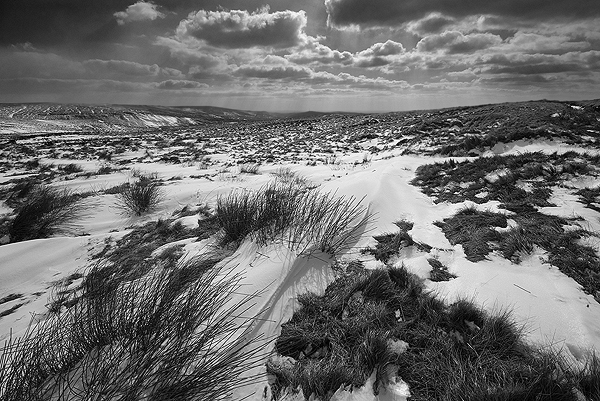 Much of the moorland of the Peak District was privately owned and used for only a few days of the year for grouse shooting. A few footpaths allowed access to about one percent of the Peak District, access to the vast majority of moorland was forbidden. Rambling associations tended to be composed of the middle classes, with Dukes and Earls amongst their patrons. 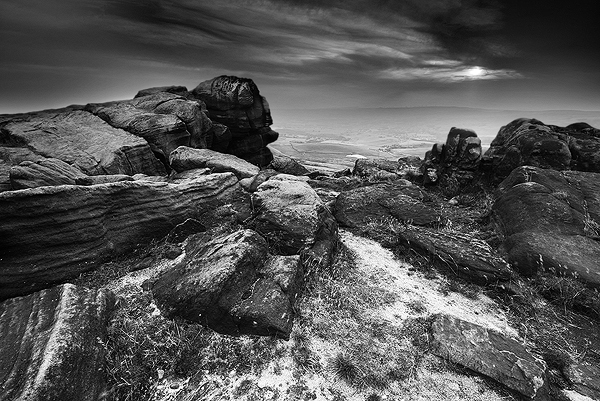 Climbers at Stanage Edge used to bribe gamekeepers to turn a blind eye to their activities with barrels of beer. By the 1920’s and 1930’s however, rambling was becoming a much more popular pastime amongst the working classes. It is thought that tens of thousands of ramblers would head for the Peak District every Sunday. Resentment began to build to the landowners who barred access and the slow lobbying of the official rambling associations. In 1927 a mass trespass took place at Winnat’s Pass, organised by the Sheffield Clarion Ramblers. Flyers distributed around Manchester called for attendance at a rally in Hayfield Recreation Ground on 24th April. This was changed to Bowden Bridge Quarry at the last minute to avoid the police and the Parish Council, who had posted copies of local bylaws forbidding meetings there and supplied the Parish Council Clerk to read them if anyone attempted to make speeches. About 400 ramblers met at the quarry, and after short speech by Benny Rothman, who stepped in when the scheduled speaker decided to pull out, set off along the legal footpath towards William Clough at 2.00pm. At Nab Brow, they caught first sight of the keepers dotted along the slope beneath Sandy Heys. A whistle was sounded for the troupe to stop. On a second whistle they turned right to face Kinder Scout. When the third whistle sounded, they began to scramble up the steep slope towards the keepers. Although a few minor scuffles ensued and in some cases, the gamekeeper’s sticks were taken and turned against them, there was only one injury (a gamekeeper knocked unconscious suffered a twisted ankle). In the majority of cases, the protesters just walked through the line of keepers, where they reformed and headed for the plateau. Once at the top, they were greeted by a smaller group from Sheffield (possibly from the Clarion Ramblers, another Socialist inspired walking organisation), who had made their way up from Edale. This account was later challenged by one of the gamekeepers, who claimed that no other party had been present that day. They then pressed on to Ashop Head, where a short rally was held to congratulate the participants on a successful trespass. It was suspected that some may be fined upon their return and a hat was passed around for donations. The party then began to make their way back to Hayfield, retracing their steps along the path down William Clough. They were met by the police at the Stockport Corporation Water Works and an attempt was made to grab someone from the crowd but was chased off by the ramblers. At the beginnings of Hayfield village, they were met by an inspector in a police car, who suggested that they form a column behind him to lead them into the village. They did this and sang as they marched into Hayfield. It was of course a trap, as when they reached the centre of the village they were stopped by police who began to search amongst them, accompanied by gamekeepers. Six arrests were made (five on the return to Hayfield and another later that afternoon). Benny Rothman was one of those arrested. They were first of all detained at Hayfield, then taken to New Mills, due to the crowd gathered outside calling for their release and charged with unlawful assembly and breach of the peace (notably not trespass, which was a civil offence), as the Duke of Devonshire insisted on pressing ahead with charges. All pleaded not guilty, so Benny Rothman, Tona Gillett, Harry Mendel, Jud Clyde, John Anderson and Dave Nesbitt were committed for trial at Derby Assizes. It was said that the jury was composed of a cross section of the Derbyshire country establishment, including two brigadier generals, three colonels, two majors and two aldermen. Despite an impassioned speech by Benny Rothman, they were handed jail terms of between two to six months each. 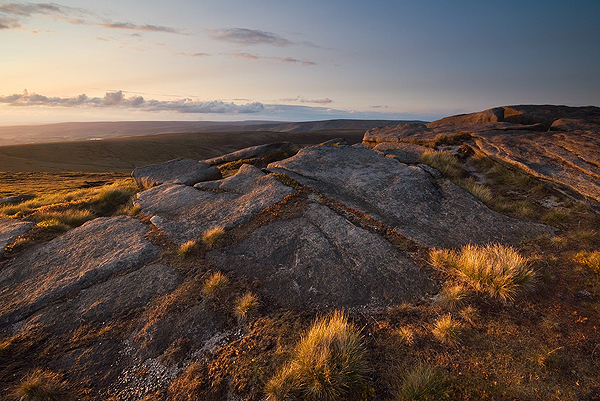 A summer sunset at Kinder Scout, looking towards Ashop Head. The sentences, seen as draconian even then, caused outrage and probably did more to promote the cause than the trespass itself. The trespass also caused division amongst rambler associations, who had been petitioning for an Access to Mountains Bill in Parliament since 1884 and held rallies at Winnat’s Pass since the mid 1920s. They were of the opinion that access could be negotiated and were very different to the young trespassers who saw access as a matter of right. A few weeks after the trespass, 10,000 ramblers assembled at a rally at Winnat’s Pass. It was clear that momentum was beginning to build. The years following the trespass would see slow steps towards access. Throughout the 1930s, moves were made towards the creation of national parks, an idea first raised by Ramsay MacDonald in 1929 and the subject of the Addison Report in 1931, although it would be another 19 years before the establishment of the Peak District National Park. The Addison Report was kicked into the long grass during the depression of the early 1930s but resurrected at a conference in 1935. The Standing Committee for National Parks was formed in 1936 and published ‘The Case for National Parks in Great Britain’ in 1938. Throughout the 1940s, the momentum towards the establishment of national parks continued, including the publication of the 1947 Hobhouse Report, suggesting 12 potential national parks. This resulted in Clement Atlee’s visionary post-war Labour Government passing the National Parks and Access to the Countryside Act 1949. The Countryside Commission and the Nature Conservancy Council were formed under the new act. Both merged in 2006 to form Natural England. 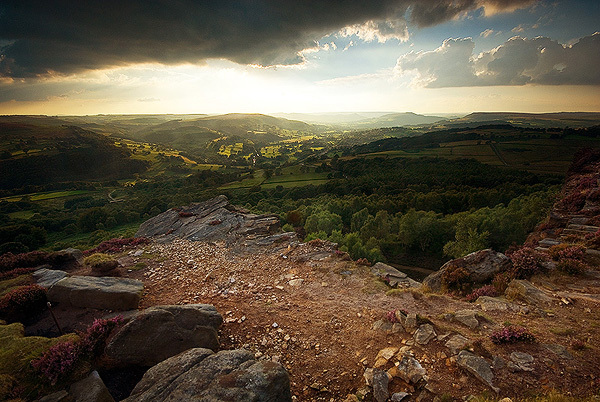 On 17th April 1951, the Peak District National Park became the first of its kind in Britain. In 1955 the first access agreement for Kinder Scout was signed and in 1962, access to Stanage Edge was agreed. Alongside these gradual steps towards the creation of the national parks, a special mention must be given to Tom Stephenson, who in 1935 set into motion the idea of the ‘Jubilee Trail’. Many long years of negotiation followed and his dream was eventually realised when in 1965, the Pennine Way opened, stretching from Edale to Scotland. It is a source of great happiness that Benny Rothman lived to see this act passed. He lived to celebrate his 90th birthday, passing away in January 2002, just a few weeks before the 70th anniversary of the trespass. Since it’s creation, the Peak District National Park Authority has worked to improve access, biodiversity, learning, safety, management and planning. However, the current government’s assault on public funding has also effected the PDNPA, whose budgets have been slashed. The effect of this is that much of the small percentage of the Peak District that the authority actually owns, is now up for sale or lease. 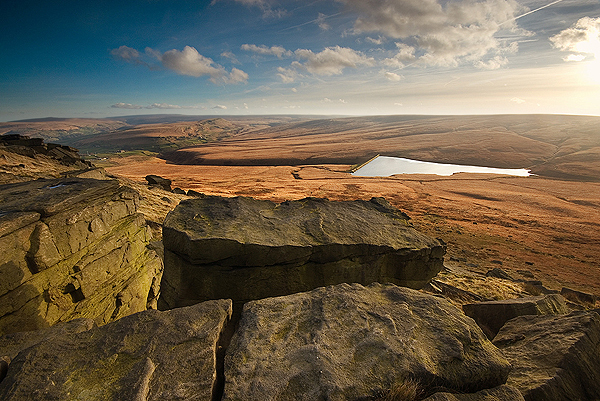 Recently the PDNPA agreed a lease partnership for the Eastern Moors with the National Trust and the RSPB (who also lease Dovestones Reservoir and it’s surrounding moorland from United Utilities). The authority has also found it necessary to offer up the Roaches and Stanage Edge, in the hope of attracting similar lease deals. Of course, it is a condition that any partners will maintain the natural habitats and access that goes with these iconic Peak District locations. Although there seems to be no immediate threat to access at these locations, or any current danger of the break up of the PDNPA, it is always worrying when those things that were previously held in public ownership are passed on to private control and one cannot help but fear that this could just be the thin end of the wedge. Already the current Tory led government have floated the idea of selling off the nation’s forests, to be met with a backlash so furious (thanks in part to the petitioning website 38degrees.org.uk) that they immediately backed down. Had this policy not been met with such overwhelming opposition, it is almost certain that the national parks would have been next. It is concerning that other legislation could have a negative effect upon our green spaces, such as the recent Localism Act that places our countryside in real danger. It places profit and national economic policy before conservation. It dictates that the default position for any planning application is to be “yes”, planning authorities are obliged to “meet local development needs” and deliver a 20% increase in land available for new build housing. The act is the result of intense lobbying by the construction industry. 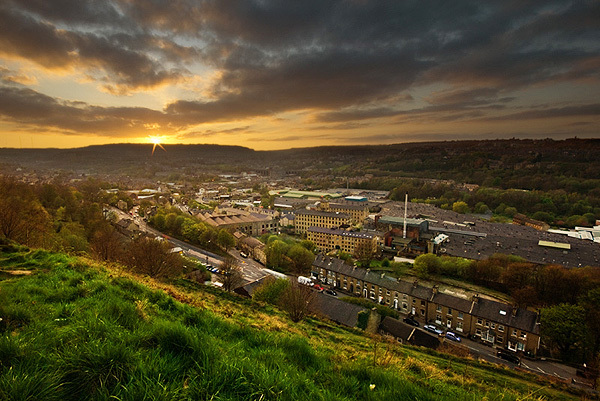 In towns and cities, there could well be enough brown belt land to meet these needs (although Kirklees Council have just ear-marked a considerable amount of green belt for development), the countryside however, without reserves of ex-industrial brown field sites, will probably have little choice but to make green belt available to developers. Although many victories have been won over the long course of the struggle for access, it would be easy for us to become complacent in thinking that as access to some of the country’s best natural spaces are currently enshrined in law, that these rights are secure. This regressive government’s mood is one of rolling back public funding under the guise of austerity and it would come as no great surprise that, if access laws were judged to be an obstacle to private profit, there is every possibility that they could be repealed. As with our hard won rights in other areas of society, we owe it to our forebears to keep ourselves informed and ensure that their centuries of struggle for social progress are not undone. That we avoid sleepwalking into a future, where our rights to the land that we all cherish are taken away from under our feet once again. The next time that you walk on the moorlands of the Peak District, or further afield, remember that raggle taggle band of ramblers, who came to Kinder Scout from the mills and factories of Manchester and Sheffield 80 years ago, and thank them and those that followed for the fact that you can now walk freely where you choose in these high places of beauty. And if ever it is suspected that any government minister, landowner or company executive is attempting to take those rights away from you, just ask yourself, what would Benny do? This article originally appeared on Peak District On-line.